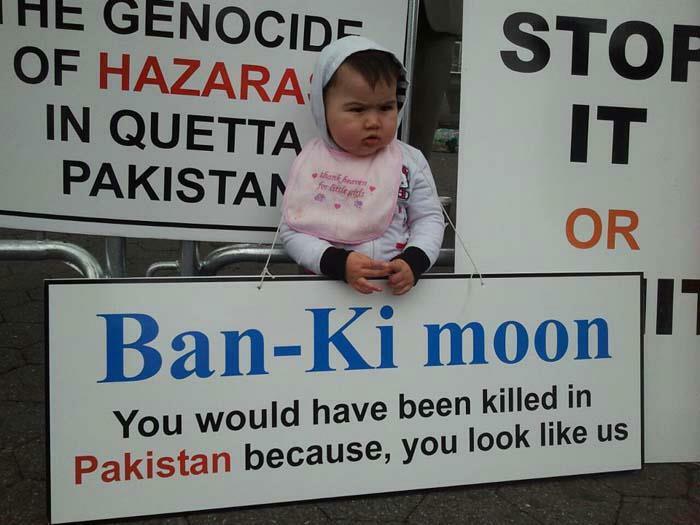 This Young Kid is protesting in front of UN Office in New York. He demands UN for Justice. This kid was protesting in front of United Nations Headquarters in New York and demand Justice for the Shia Hazara Community. The wording in his billboard mention the Secretary General of United Nations, “Ban-Ki-Moon, You would have been killed in Pakistan because, you look like us”. Shia Hazara Community has their particular shape and they can easily be recognized with their faces. This man (Irfan Ali) was from Quetta. He was martyred along with other 96 martyrs as part of killing campaign against Shia Hazara Community. Irfan Ali was a famous activist who in his own words was born to fight for human rights and peace. My religion is respect and love all the religions. He always worked for the Peace and Human Rights along the country. He always served humanity. He went to the victims of first blast to help them, to provide them medical facility and then second blast snatched his life. 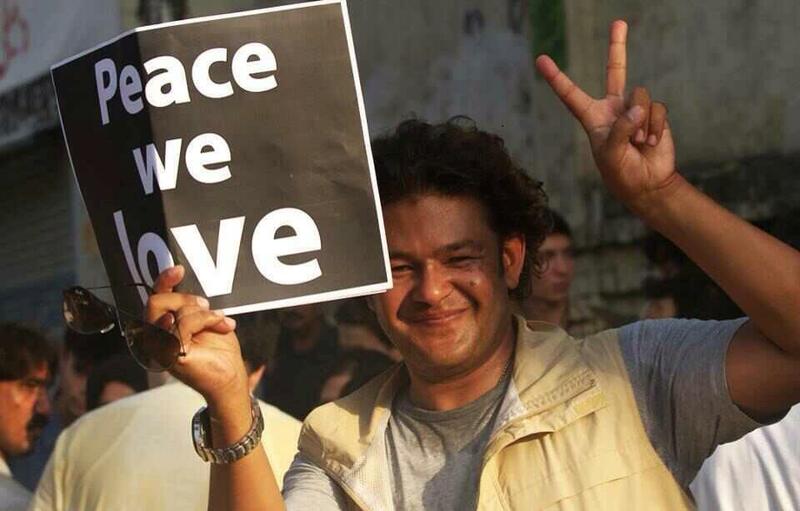 Dear Irfan, We will always miss you and your contribution for the peace and humanity are priceless. Your name will always be remembered in the good book. Syed Mahmood Kazmi protesting against killing of Shia Hazara community at Lahore. When whole world chanted for Justice, Government of Pakistan woke up from their conscience-free sleep. They dismissed Chief Minister of Baluchistan Province and sacked provincial Government. Governor Rule is imposed and FC/Police has been called for improving law and order situation. All across Pakistan, it’s been proved that all Muslims are one and united, Shias and Sunnis are brothers and there is no such thing like enmity or hatred between us..Countless Sunni brothers became part of “Dharna” to show their affiliation and affinity with their Shia brothers and sister…Its a true tight slap on the face of opportunist who try to build a wall and weaken the bond between us. Long live the unity between Muslims..We are all one. I wish this genocide against Shia Hazara Community can be ended now. Government of Pakistan, Armed Forces and Intelligence Agencies must play their active role to brought the culprits into the court of Justice. 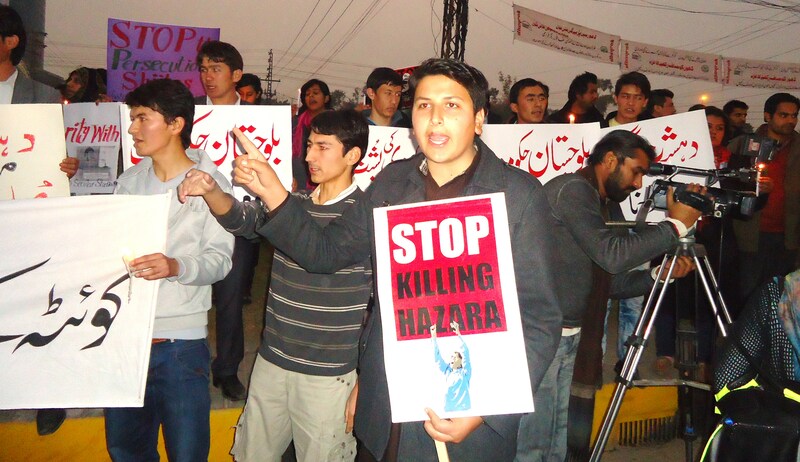 All the families of Shia Hazara Community are demanding for Justice. The martyrs sacrificed their lives already. What else can be more worthy to sacrificed for this country? Lets be united against these culprits and miscreants for the cause of peaceful and prosperous Pakistan. ← Taliban! Be Afraid. We will educate every girl. Seeing you standing with the minorities of Pakistan for their rights and protection makes me hopeful. ssp is not real ahle sunnat wal jamat but spoiling sunnis and is responsible to trigger the clashes. shame on us for killing our own brothers. no one is safe in Pakistan yet everyone is in a slumber hoping against hope that the fire will not burn them. our habit of sweeping the dust under the carpet will simply not work out this time. today a 12 year old student of seventh grade from Aitchison college Lahore was brutally killed along with his father, his crime was to belong to a Shia family. first learn to be a human before calling yourselves Muslims.